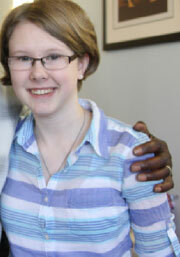 A tremendous congratulations to this month’s patient spotlight, Samantha Kerrigan, 16. Samantha (pictured in a photo courtesy of the Riverhead News-Review) is a gifted poet who recently attended Poetry Street at the Blue Duck Bakery in downtown Riverhead. Poetry Street, a summer series of poetry open mic sessions, is a part of the East End Art’s JumpstART, a program that aims to revitalize downtown Riverhead via creative partnerships between artists and local businesses. Samantha was the event’s youngest reader and also received the afternoons only standing ovation. At Poetry Street, Samantha shared a poem titled “Mirrors.” Her work examined themes of hate, low self-esteem, family, age and love. The poem chronicles one woman’s life, from birth to old age, possessing a depth one would assume was beyond Samantha’s sixteen years. From all of us here at Peconic Pediatrics, congratulations Samantha and we look forward to hearing more of your work as well as the accolades you receive in the future! To read Samantha’s poem, see below. And strangers are touching her. And she doesn’t know them. And the tired faces look more tired. She smiles because she doesn’t know how to hate. And talk to each other in strained ones. Because that’s what his dad does to his mom. Because she is surrounded by love. And she likes to learn. A threat used by teachers. And learning how to count. Because that’s what the teachers are doing. And they don’t answer her questions. Until he kisses her best friend. Because now she knows how to hate. Because it means she doesn’t have to go to school. But to her they look the same. Even though she’s still a kid. Because that’s what everyone else is doing. And she somehow misses high school. And she misses when everything was new. And she looks in the mirror and cries. She moves away from the boy and tries again. And she’s learned how to love again. And she looks just as young to them. He smiles because he doesn’t know how to hate. And the tired face of a mother. Because they still looked young to her. And she needs a cane. The same way her mom used to. Because she knows how she looks already. And this makes her scared. And she doesn’t understand how this could be. Because she’s forgotten how to hate.